There's a certain little State No one thought was up to date Jokes about it made a lot of fun But folks are getting hunches Going there in bunches A mighty mob has started on the run Tho' small in size that state is wise nobody hesitates It's population soon will be the whole United States. Everybody's on their way to Jersey Everybody's going there to stay And it's not the air That they're going over there There is something doing something brewing OH! BOY! 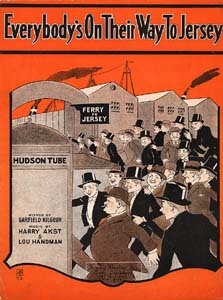 buckets of joy Three and a half percent in dear old Jersey Is not the dividends the bankers pay Just hop on a train and tell the man that you want to go where they rush the can For everybody's on their way to Jersey.